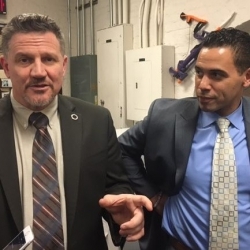 Kevin Brown and Rodney Butler, leaders of the longtime rival Mohegan and Mashantucket Pequot tribes, joined forces to champion the East Windsor casino. The East Windsor casino received approval from the U.S. Interior Department’s Bureau of Indian Affairs, allowing Connecticut tribal gaming authorities to move forward with plans to build a satellite casino in the Hartford area. The Mohegan Tribe and Mashantucket Pequot Tribe, which respectively own Mohegan Sun and Foxwoods casino, have a joint venture to build the East Windsor casino. The Indian Affairs Bureau plans to publish official approval on March 25 in the Federal Register, a requirement for any tribal casino to be built legally. Approval for the East Windsor casino had been held up for over 2 years. When it became evident that MGM Resorts would build their $960 million integrated resort in Springfield, Massachusetts, the two tribes grew concerned that the MGM Springfield would hurt the slots revenue at their casinos in southeastern Connecticut. Hartford is roughly 25 miles drive in a car from Springfield, while it is an hour away from Foxwoods Casino and an hour-and-10 minutes away from Mohegan Sun. Since Hartford residents could make a trip half as long to a newer, bigger casino, Mohegan Sun and Foxwoods were concerned they might lose as much as 25% of their slots revenue when MGM Springfield opened. Connecticut lawmakers were just as concerned that the state would lose tens of millions of dollars in tax revenues each year. For that reason, the East Windsor casino was fast-tracked by the state legislature and signed by then-Gov. Dannel Malloy. Even though the satellite casino would be a “slots-in-a-box” type gaming venue, having a casino the Hartford metropolitan area meant most residents would drive 5 to 10 minutes to the East Windsor casinos, instead of the MGM Springfield. Though some locals groused about the decision to place the casino in East Windsor instead of another suburb without a great amount of debate, the East Windsor casino development plan had broad support in the state. MGM Resorts fought the plan in a variety of ways. First, it sued the State of Connecticut claiming their decision to award a casino license without a full, open licensing process was a violation of the Connecticut constitution. MGM Resorts claimed they had a plan for an MGM Bridgeport casino, but Connecticut officials summarily dismissed their license application. Most saw the MGM Resorts lawsuit as a plan to stall for time, hoping their casino could open and build a customer base before the East Windsor casino was built. For marketing reasons, casino companies see huge value in building a customer database, so a Hartford area resident visiting MGM Springfield once and signing up for a slots card or casino card would be invaluable to the new casino. The lawsuit eventually was stopped by a judge, but the Mohegan Tribe and Mashantucket Pequot Tribe allege that MGM Resorts’ plots did not stop there. Instead, they claim that MGM Resorts lobbyists met with then-US Interior Secretary Ryan Zinke about the MGM/Connecticut dispute. Also, they allege Nevada lawmakers (MGM Resorts is located in Las Vegas) may have lobbied Ryan Zinke inappropriately. Those charges gained weight when the Bureau of Indians Affairs declined to rule on the East Windsor casino plan, despite having a 90-day window to do so. After a year without an answer, the tribes sued to receive an answer. A judge ruled that Ryan Zinke’s department must rule, though he could rule either for or against the plan. Ryan Zinke’s lieutenants ruled against the plan, further leading to speculation they were influenced by MGM Resorts’ lobbyists. Until Zinke left office in December 2018, those charged dogged the Interior Secretary. Now, four months out from his departure, the new leadership at the Interior Department has given a different answer to the East Windsor casino plan.